The current season has another month to go, but I’d like to dub the preceding 3 months as “The Summer of the Blah Blockbuster”: X-Men: Apocalypse, Alice Through the Looking Glass, Independence Day: Resurgence, Ghostbusters, and Star Trek Beyond. All big budget productions that made far less than their hefty price tags prescribed. The audience numbers have been underwhelming. To be fair, not all cinematic product is created equal. I found the latest X-Men enjoyable, but I still wouldn’t call it necessary viewing unless you’re an X-Men completist. And that’s true of all of these releases. Other than an opportunity to make money, their stories lack a reason to exist. Did we need this film? The answer is no in every case. Into this atmosphere we get the creatively titled Jason Bourne. It feels right at home in the prevailing Hollywood climate. Jason Bourne is the fifth installment of the Bourne series. 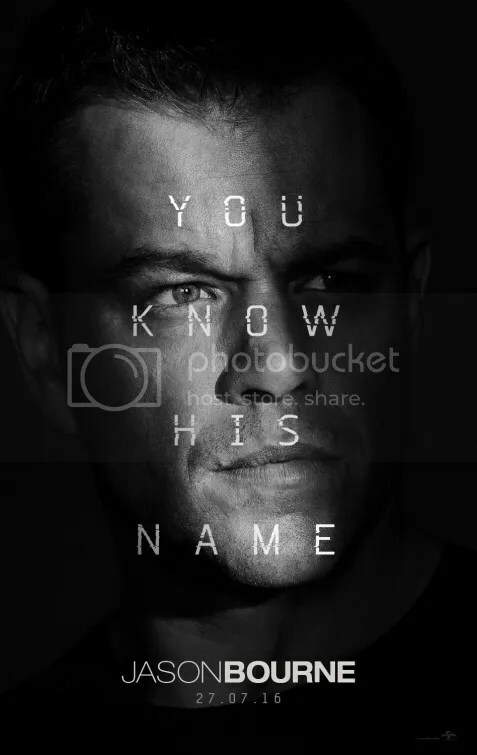 This is a direct sequel to The Bourne Ultimatum, the third chapter and the last to feature Matt Damon. You’d think the previous star Jeremy Renner might warrant a cameo, but no such luck. Paul Greengrass is back directing, making this is third venture into the Bourne franchise. I concede that recounting all these facts is kind of boring to read, but writing about such a workmanlike movie almost demands it. The story picks up 10 years after the events of The Bourne Ultimatum. Jason Bourne is hiding out in Greece and has taken up illegal brawling. This is a good time to note that Matt Damon is seen knocking a big guy out in one punch and it’s the most clearly shot action scene in the whole picture. Anyway, the former CIA assassin and recovering amnesiac is finally starting to remember who he is. Ex-CIA agent Nicky Parsons (Julia Stiles) has discovered some distressing information and has decided to contact Bourne with the info. Bourne seeks to find out the truth behind the death of his father, Richard Webb (Gregg Henry). Meanwhile CIA Director Robert Dewey (Tommy Lee Jones) and CIA agent Heather Lee (Alicia Vikander) aren’t happy with these developments. They are implementing a new program aimed at taking Jason Bourne down. Jason Bourne is a somber thriller filled with dispassionate people doing very serious things. There’s some added nonsense about a Las Vegas tech convention with actor Riz Ahmed. He plays the CEO & Founder of a social networking app called Deep Dream. The CIA wants to spy on everyone through a back door surveillance program dubbed Operation Iron Hand. I couldn’t even summon up the energy to even give a care about this story tangent. I only mention it because actor Riz Ahmed was also in Nightcrawler and it’s another chance to promote the fine actor’s work in that film. At least his tech tycoon registers a little personality. None of the other actors express much emotion. No one even cracks a smile. Perhaps with Matt Damon, Tommy Lee Jones and Vincent Cassel, the stoicism is a bit more expected. However Alicia Vikander was such an effervescent presence in The Danish Girl. Although I admit she was also brilliant as a robot in Ex Machina. I’m just not sure why she was told to act like one here. What follows is a lot of perfunctory chase sequences. We get shaky cam photography of chaotic movement edited with a hacksaw. Ladies and gentlemen, I present an entire feature made up of fast cutting. No scene lingers for more than 3 seconds before proceeding to the next shot. The ADHD cinematography can be frustrating. “Stop I want to get off!” I almost screamed, like right there out loud in the theater. Two people simply have a quiet conversation and the camera refuses to remain still – a nervous bundle of energy, constantly moving. Ok so at times it can be exhilarating as well. The camera jerks and dives to thrilling effect during a climactic fight. The motion gives the feeling of actually being physically hit before descending into a blurry mishmash where the human combatants are no longer discernible. Director Paul Greengrass is known for favoring this technique. He’s had much success in the past (United 93, Captain Phillips), but the plot developments aren’t memorable this time around. We’re just going through the motions. In the end, I didn’t hate this movie. It’s too competent to be egregious. The effort fuses high production values with well choreographed action. Jason Bourne isn’t good, but it’s significant because it exemplifies how this kind of entertainment is now available on TV for free. I suppose two out of three ain’t bad. 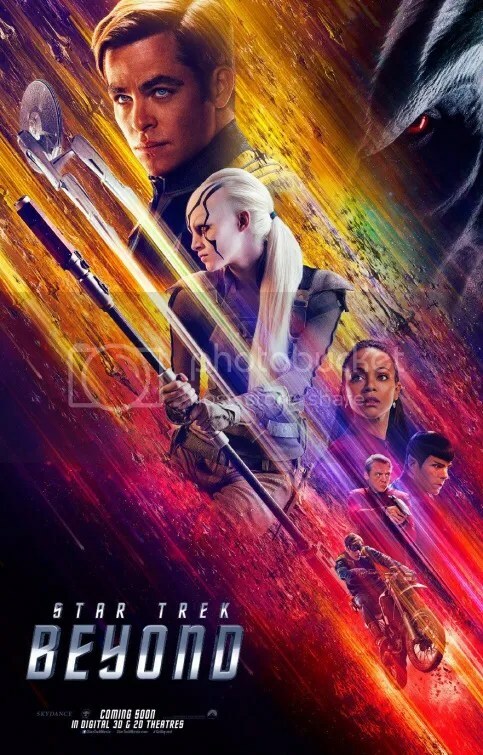 After director J.J. Abrams’ spectacular reboot on the franchise simply titled Star Trek in 2009 and his equally thrilling follow-up Star Trek Into Darkness, the series takes a giant leap backward with Star Trek Beyond. How giant? Well, this is the weakest chapter in the franchise since Star Trek V: The Final Frontier (1989). J.J. Abrams is still listed as one of the producers but this entry has different writers (Simon Pegg, Doug Jung) and a new director, Justin Lin of The Fast and the Furious 3–6 fame. Lin is unquestionably a talented filmmaker that has brought much life to those car racing films, but his broey aesthetic is a clumsy fit for the Star Trek universe. The philosophical intellectualism that usually inhabits Gene Roddenberry’s creation is tossed aside. Less thinking, more destructive action is the primary agenda here. Captain James T. Kirk (Chris Pine) and his team are 3 years into their 5-year mission to explore the ends of the cosmos. Kirk’s upcoming birthday has him wistfully thinking about his deceased father. He is seeking the position of Vice Admiral and requests that Spock be made captain of the Enterprise. Kirk has become rather bored by his duties. The disinterest is contagious. His colleagues are dispassionate too. Spock (Zachary Quinto) and Uhura’s (Zoe Saldana) relationship continues to play out in tedious exchanges. The two unduly concerned with the soap opera of their lives rather than their mission. Things finally get shaken up when a distress signal leads them to an alien named Kalara (Lydia Wilson), who asks for help in rescuing her people on the far side of the galaxy. On the way there, they are attacked by more aliens led by Krall (Idris Elba). It’s hard to pinpoint how an acclaimed actor such as Elba could become such a dull villain, but somehow he manages that unimaginable feat here. His raid causes the crew to be dispersed as they abandon their beloved USS Enterprise. Scotty lands on a forest planet and is saved by another alien named Jaylah (Sofia Boutella). More stuff happens. Little of it memorable. Star Trek Beyond is an odd creation. So safe, so boring, so utterly devoid of anything new or innovative – it feels like the mandatory enforcement of a contract to release another Star Trek film. Check. Obligation fulfilled. The movie is at its best when the personalities of the esteemed cast are highlighted. After the Enterprise team abandons ship during Krall’s attack, the crew is dispersed. Spock and Bones (Karl Urban) are isolated together and it is during their interactions on a foreign planet that the script momentarily springs to life. What does Star Trek BEYOND mean exactly? Even the title lacks definition. May I suggest Star Trek: Generic Space Action Movie. Sadly, most of Beyond plays out more like a Fast and Furious movie with visual effects here substituting for much needed depth. The adventure is shockingly routine for a production of this magnitude. The story is just too insubstantial for a 2 hour motion picture. This develops like a rejected plot from the 60s TV show expanded to feature length. Then the music of the Beastie Boys makes an incongruous appearance in one key scene. The song’s arrival is eye-rolling to say the least. What in Gene Roddenberry’s name is that song doing here? However 24 hours later, and it’s the only thing that still stands out in my mind. At least I remember they played ‘Sabotage’ really loud. What a shame that it’s all I remember. Taika Waititi is a major talent. New Zealand already knows this after several of the director’s offbeat films, which include Eagle vs Shark, Boy and What We Do in the Shadows, have become hits in that country. The latter comedy was one of my favorites of the year when it was finally released in the U.S. in 2015. On November 3, 2017, the rest of the world will come to know Taika Waititi’s name when Thor: Ragnarok (Thor 3) is released. His latest, Hunt for the Wilderpeople, is a quirky joy. A movie fashioned with such care and so much warmth that it practically leaps from the screen and gives the audience a hug. It’s based on the book Wild Pork and Watercress by New Zealand author Barry Crump. Crump’s semi-autobiographical tales are often comic adventures set in the rugged outdoors. 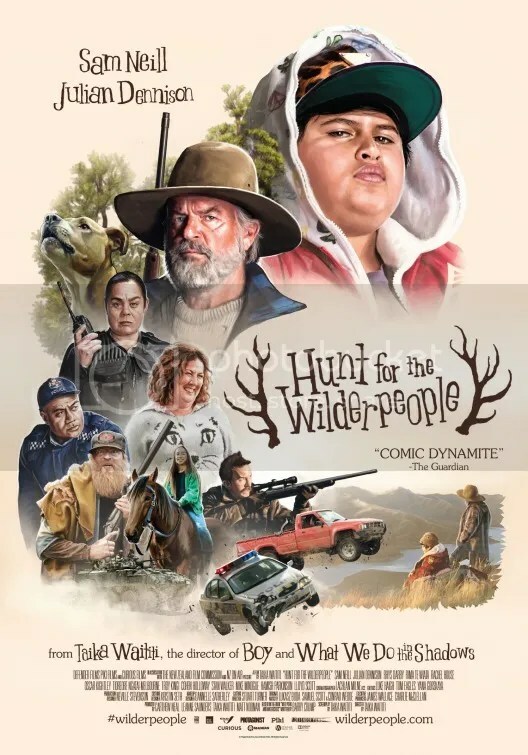 Wilderpeople is no different. The saga stars a famous name in actor Sam Neill as Uncle Hec, a grizzled man. He chases after Ricky Baker (Julian Dennison), a defiant city boy after Ricky runs away from home into the forest. But let’s start at the beginning. Sweet Aunt Bella (Rima Te Wiata) and cantankerous Uncle Hec (Neill) are Ricky’s latest foster parents. Living in the country has been an adjustment for the city kid. Aunt Bella is chipper although her bloody killing of a boar does frighten the child a bit. However Ricky finally seems to have found a family he likes. When Bella abruptly passes away, the authorities threaten to extract the youngster and place him in yet another foster home. Fearing more bad experiences, Ricky runs away into the wild. Uncle Hec follows after the boy. When strict child-services worker Paula (Rachel House) discovers the missing pair, a manhunt ensues. Ricky is an orphan that has been shuttled around in the foster care system. Raised on hip-hop and affecting a gansta lean (that is if he was actually old enough to drive) he’s been labeled as a bad egg. Nothing could be further from the truth. With dog Tupac by his side, he is disarmingly charismatic. The elderly geezer and the young whippersnapper, thrown together by fate, united by friendship. The idea sounds clichéd but in the hands of Sam Neil and especially novice actor Julian Dennison, the idea is fresh and delightful. Dennison is the secret weapon of the chronicle, bringing a fresh interpretation to a character that charms us almost immediately. A heavy set kid of about 12, there’s a physicality to his performance that makes his precociousness all the more amusing. Hunt of the Wilderpeople is a beautiful blending of a road movie and a coming of age tale. Like the novel, the production is divided into chapters, each with its own title. The whimsical adventure fashions amusing vignettes that, like delectable morsels, are easily digestible in bite size pieces. With gorgeous scenery as a backdrop, a musical score charms with a retro 80s feel courtesy of the band Moniker . “Trifecta (Ricky Baker Song)” is a highlight. Musical interludes are inserted amongst sharp, witty moments between Uncle Hec and the tender lad. If there is a quibble, it’s that the plot drags on a bit too long when a tighter narrative might have made the ending pop a bit more . By the time the story finally wraps up, we’re more than ready for things to end. Still, there’s a preciousness that touches the heart without ever being overtly twee. It recalls the work of Wes Anderson. Believe me, that’s a compliment of the highest order in my book. Actor Sam Neill and newcomer Julian Dennison have an odd couple chemistry that makes this “hang-out” yarn thoroughly enjoyable. The veteran actor is good but the rookie is even better. Julian Dennison steals the film and probably your heart as well. I don’t think I could’ve been more primed to like this film. (1) I adore the classic 1984 comedy and the concept of a distinctly fresh version of Ghostbusters sounded like fun. (2) I am a huge fan of the cast. Melissa McCarthy has the whip-smart comic timing that can shape even a stale bit into a gem. Kristen Wiig is a genius of oft kilter humor. Up-and-comers Kate McKinnon and Leslie Jones are rising stars whose work on Saturday Night Live is among the most outstanding on that show right now. (3) Bridesmaids was one of the best features of 2011. It made my Top 10 for that year. Reunite the director Paul Feig with two of that picture’s personalities and watch their obvious chemistry unfold again. (4) The pre-release internet hate directed at this production was so unfounded I was tempted to give the movie a pass simply to prove the naysayers wrong. The good news is that Ghostbusters is not the disaster that the internet predicted. Yet it’s far from the inspired reboot for which I was hoping. The set-up: Many years ago, Dr. Erin Gilbert (Kristen Wiig) and Dr. Abby Yates (Melissa McCarthy) collaborated on an unpopular book about paranormal phenomenon. When Gilbert realizes the book has been republished, she seeks out Yates to undo an embarrassing situation that might damage her tenure at Columbia University. In the ensuing years, Yates has continued to study the supernatural with eccentric engineer Dr. Jillian Holtzmann (Kate McKinnon). Yates coaxes Gilbert into joining her on another investigation in exchange for squashing the book’s publication. And so they’re off to fight ghosts. Joining them are MTA worker Patty Tolan (Leslie Jones) who sees a ghost in a subway line and contacts the Department. She joins the team a while later. Jones is normally a uniquely dynamic presence on SNL but here she is given nothing more to do than pedestrian shtick. Unfortunately the sidekick part fails to highlight the sharp comedic gifts she displays every week. Shouting your lines doesn’t make them funnier. There’s also Kevin Beckman, a feebleminded but handsome receptionist (Chris Hemsworth). I could easily fault the “himbo” act for being nothing more than a dumb blonde role reversal joke. The thing is, he’s actually one of the funniest things in the film. Credit his affable charisma for taking a flimsy part and making it funny. Of the four Ghostbusters, only Kate McKinnon truly elevates her loony scientist into something interesting and original. She interprets lines that would normally fall flat in the hands of a lesser actress. By delivering them with an off beat sensibility, she makes the character her own and not a pale imitation. A relative unknown, she has the most to gain from this exposure. I suspect this credit on her resume will be a nice stepping stone to greater things in her career. However established stars McCarthy and Wiig have been lobotomized. They seriously downplay their normally quirky appeal here. Perhaps that’s admirable. This is an ensemble piece and it allows others like McKinnon and Hemsworth to shine. However, in the process we lose what makes their comedic personas so invigorating. 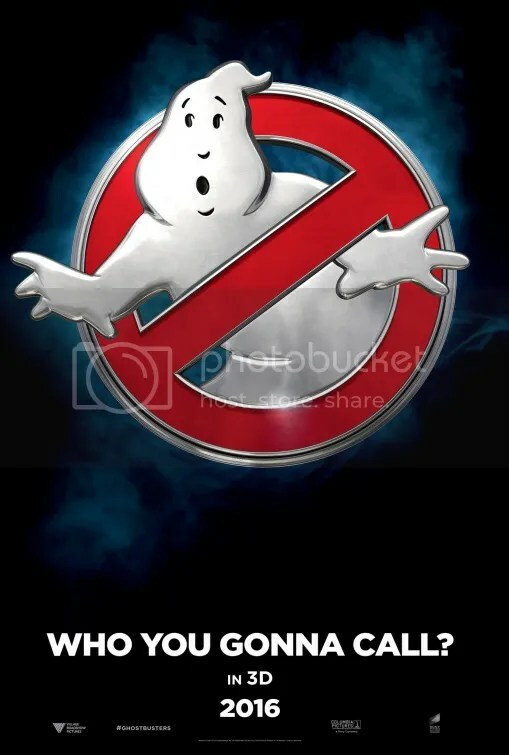 Ghostbusters is a largely uninspired take on a well known property. The story scores points for changing up the plot at least. Like a remix of a classic song with a new singer and modern production, it entertains based on familiarity but not through excellence or innovation. Ok so Kate McKinnon and Chris Hemsworth are amusing, but the script hangs the rest of the cast out to dry. In lieu of a Sumerian deity from another dimension brought back from the dead, we get a nerdy petulant weirdo (Neil Casey). He is a weak excuse for the main villain. Humor is subjective, but I rarely laughed and that’s a deal breaker when assessing a comedy. This cacophonous spectacle wants it both ways. Embrace a modern take, while constantly reminding you of nostalgia for the 1984 original. Star cameos abound with Sigourney Weaver, Bill Murray, Dan Aykroyd, Ernie Hudson and Annie Potts all in conspicuous bits that distract from, rather than add to the narrative. The idea of a summer blockbuster that headlines 4 women celebrated for their witty minds, and not their physical attributes, is exciting in theory. I so very wanted this movie to be spectacular. Instead it’s just barely acceptable. They don’t call Todd Solondz “The King Of Feel-Bad Cinema” for nothing. Few directors expose the horror that exists beneath the well manicured facade of the suburban dream as frightfully as he. Wiener-Dog is only his 8th feature since 1989. A prolific filmmaker he is not. Welcome To The Dollhouse was the 1996 picture that put the New Jersey native on the indie map. It still remains his biggest success to this day. While subsequent releases have seen less box office, most have achieved a certain level of critical acclaim. All are informed by his cruel, albeit multi-layered take on the human condition. 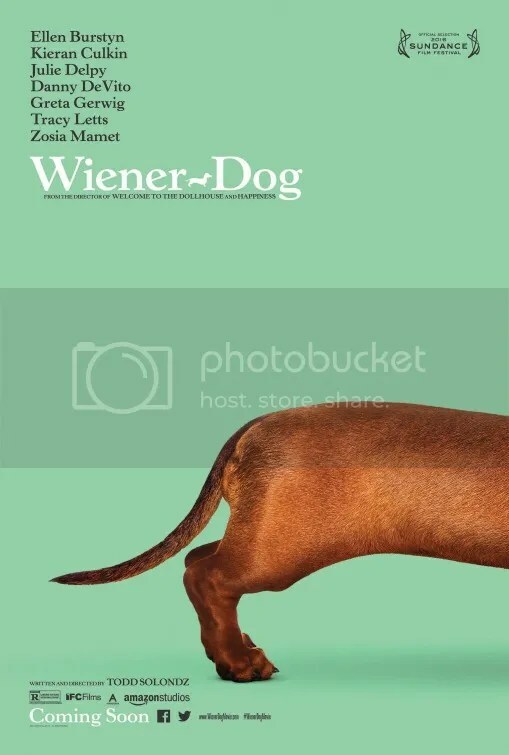 In Wiener-Dog, four tales are linked together by the presence of the same dachshund. As she inhabits the lives of four different individuals, we come to learn the details of the families within. There’s Remi (Keaton Nigel Cooke), a sensitive little boy who is a cancer survivor, Dawn Wiener (Greta Gerwig), an awkward young woman who runs into an old crush, Dave Schmerz (Danny DeVito) a screenwriting professor disregarded by his students, and Nana (Ellen Burstyn), an elderly woman visited by her granddaughter (Zosia Mamet). You can see the director’s alter ego in the lead protagonist as the focus of each story gets a little older. The spirit of every principal beaten down by the inequities of life. Mortality is a fact of life. Death isn’t a cheerful idea, but it is real. Because Todd Solondz deals in these themes, he is not an easy director to like. His worldview is bleak and pessimistic. Oh and did I mention this is a comedy? A very funny one at that if you can cuddle up to the movie’s prickly charms. The absurdity of the conversations within can be laugh out loud hilarious at times. There’s even an intermission scored to an original countrified song called “The Ballad of the Wiener-Dog”. It adds just the right amount of levity before embarking on the production’s even more somber 2nd half. Aided by gorgeous cinematography by Edward Lachman, he lends a hyper surreality to these mundane settings. The pup in Wiener-Dog features heavily in each episode. Yet despite the title, this is really about people, not the canine. The beloved pet is merely a construct that gives us an excuse to follow an assortment of characters. There’s a world weary tone to these sagas, but there’s also the soul of humanity as well. For example the relationship between Remi and the dachshund is pure and sweet. They share a friendship to which his parents are immune. We sympathize with the various heroes in their respective vignettes, even though they may have serious flaws. There’s an authenticity to that. I mean we are flawed too, right? As the film marches to its inevitable conclusion, we brace ourselves. Todd Solondz has contempt for the Hollywood happy ending. Wiener-Dog is typified by a grisly finale that hits you like a slap in the face. Then the camera lingers on the event. There’s a palpable rage against society here. The experience may sting, but the script still makes a sincere plea for mankind. I saw hope amidst the despair. That’s kind of powerful. 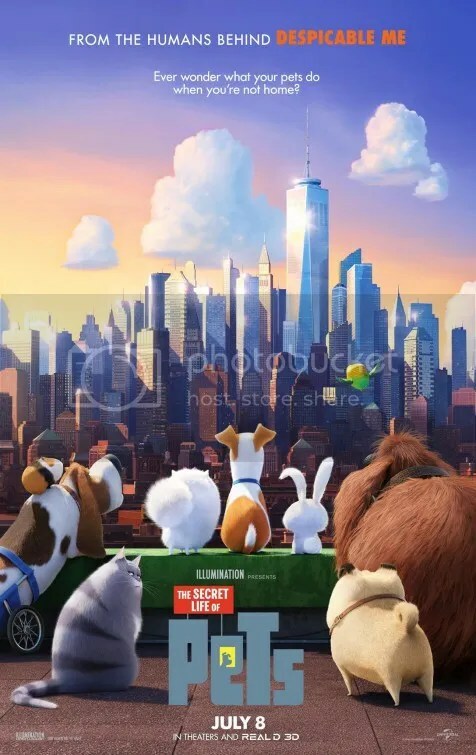 The Secret Life of Pets promises to show you what domesticated animals are really like when people aren’t around. In set-up, it’s a spiritual cousin to Toy Story. But here the mood is defined by a cursory depth and a far zanier mentality. The narrative structure is loose and free-form. Pets seems inspired by the cartoons of the 1940s & 50s from Tex Avery and Chuck Jones. Character development is minimized in exchange for the almighty gag. It’s a hodgepodge of routines but if you’re looking to laugh, it does the job. The production is overflowing with a huge cadre of personalities, an odd assortment of mostly cats and dogs given life by celebrity voices. They’re an amusing variety of individuals. At first it’s unclear which animal will be the center of attention. There are so many. However we come to understand that Max (Louis C.K.) a Jack Russell Terrier, is the star. He’s a good natured doggie, but grows rather jealous when his owner (Ellie Kemper) adopts another pet in Duke (Eric Stonestreet), a big shaggy Newfoundland. The two dogs are soon thrust into an odyssey on the streets of New York. There they meet up with a cult that promotes “The Flushed Pets” movement. They want to overthrow the humans. Meanwhile Gidget (Jenny Slate), a Pomeranian, rounds up Max’s friends in an effort to find him. Pops (Dana Carvey) stands out as an elderly basset hound with paralyzed back legs. Tiberius (Albert Brooks), a menacing red-tailed hawk is an unexpected addition. There’s a tattooed pig (Michael Beattie), a parakeet (Tara Strong) and a guinea pig (Chris Renaud) as well. However none stand out as much as Snowball, a white rabbit voiced by Kevin Hart. His manic charisma stole every scene he was in. He is hilarious. The Secret Life of Pets is largely a joy that beguiles almost as easily as it evaporates from the mind. That’s actually part of the script’s ephemeral appeal. The cartoon is brought to you by Illumination Entertainment, the highly successful film production company that brought you the Despicable Me movies. This flick wants to charm us with unfettered antics. There is a purity to that. You’d have to have the cold heart of a grinch to not at least chuckle at some of the random absurdities. At one point a bizarre hallucination sequence in a sausage factory involves a Busby Berkeley number of dancing wieners clad in hula skirts. As their heads are bitten off, they gleefully sing “We Go Together” from Grease. The eclectic soundtrack also includes selections from artists as disparate as Taylor Swift, System of a Down, Queen, Nappy Roots, Ringworm, Beastie Boys, Bill Withers, Andrew W.K. and N-Trance with their the 1995 remake of “Stayin’ Alive”. Sadly, a compilation of all this diverse music has not been released but you can download the selections individually I suppose. Humor targets run the gamut from behavioral shenanigans to poop jokes. And yes there are one too many of the latter. The Secret Life of Pets is a chaotic tornado of random bits & characters. There is very little sense to this. At times, I struggled to discern the focus of the story. And yet it pops up every now and then when it needs to make an appearance or simply make us laugh. I was entertained. Sophie is an unhappy girl who lives in an orphanage. One night she sees a giant walking about carrying what looks like a large trumpet. He spies her as well. In an effort to keep his existence a secret, he reaches in and snatches the young girl from her bed. Back to his place he takes her. While he may appear to be big and scary, his true nature is quickly revealed. 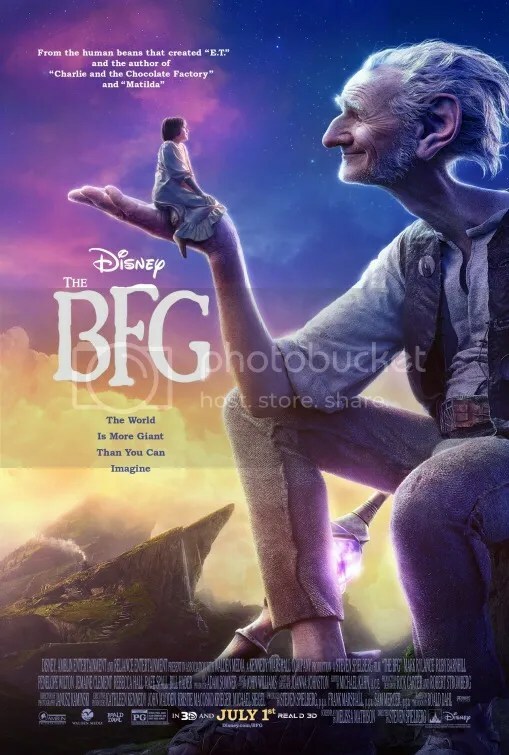 For you see, the BFG stands for “Big Friendly Giant”. The two develop a fast friendship. With Steven Spielberg directing and Melissa Mathison penning the script, expectations are high. The two have only worked together twice before: Twilight Zone: The Movie and more spectacularly, E.T. the Extra-Terrestrial. The latter hit still remains the 4th highest grossing film of all time (when adjusting for inflation). So chances are you’re aware of its legendary status. The BFG pales in comparison. Mark Rylance and Ruby Barnhill are certainly up to the task. Their portrayals are wonderful. Rylance fresh from his supporting part in Spielberg’s Bridge of Spies, shows that his Academy Award was no fluke. He embodies the titular creature with a twinkle in his eye and palpable warmth . His mixed up vocabulary is kind of cute too. The giant is manifested through a liberal use of CGI mixed with Rylance’s motion capture performance. The visual effect doesn’t look real, but it does feel magical. The problem is that The BFG is an awfully slight adventure. The fantasy is adapted from a 1982 novel by Roald Dahl. The book is barely 200 pages, so a 2 hour drama is really pushing things. For almost 90 minutes, The BFG is just a “hang out” movie. Little Sophie and the BFG merely get to know each other for the major part of the narrative. He reads her a book, she falls asleep. Then he gives her a dream. Instead of eating humans, he cooks up snozzcumbers which are these repugnant vegetables. The word suggests a portmanteau of snot and cucumbers. Oh he also drinks a carbonated beverage called frobscottle where the bubbles go down rather than up. That’s how the gas is emitted from the body as well. In place of burps we get what the BFG calls “whiz-poppers”. This information laying the groundwork for the most protracted setup to a fart joke I’ve ever seen. It’s pretty amusing I’ll sheepishly admit. It includes a couple of corgis. Roald Dahl is the same author of classics like James and the Giant Peach, Charlie and the Chocolate Factory and The Witches. An undercurrent of evil is usually a common theme in his stores. The potential for death is a most definite possibility. In The BFG we’re told hideous giants are responsible for the disappearance of children. They regularly raid the cities under the cover of night to eat “human beans”. The BFG would rather spend his time on other things. Sophie follows him on one of his runs to harvest dreams. He then gives the good ones to children with the aid of his trumpet. This talent is later utilized in a section involving Queen Elizabeth II. This is where story developments finally take place, but they form the last 30 minutes of the plot. For most of the chronicle we have essentially watched these two make small talk and chill. The lack of action plainly begs for a musical number or two at the very least. A bit of judicious editing would have helped tighten the tale’s languid rhythms. I can’t recommended this to everyone but I will to a select few. The BFG is a cult film – a production whose leisurely charms will undeniably delight a passionate, though very small, audience.